Nespresso® Pods – All You Need to Know! | Up-dated August 2018 | Compatible Nespresso® pods offer huge benefits including big savings, eco-friendly capsules, organic and Fairtrade varieties. But they also bring up many questions. Will compatible pods work in my machine? Do they taste the same? In this complete guide, our coffee experts will answer all your questions. We’ll also give you some useful tips to help make your coffee experience even tastier. To help you navigate this article and find the section you need, click on the quick links below! Compatibility: Do They Really Work? Nespresso® Compatible Pods: What Are They? Quite simply, a compatible Nespresso® pod is one not produced by the Nespresso® brand. However, it’s designed to work perfectly in a Nespresso machine. This makes it an excellent alternative to Nespresso®. Companies that produce compatible pods include Real Coffee, Starbucks, Douwe Egberts, Café Pod, Hotel Chocolat, Gourmesso, and many more. These pods vary in design and construction. They can be made of aluminium, plastic, and other materials. Just because an alternative pod is made of aluminum doesn’t necessarily mean it’s any better than those made of plastic. It all comes down to the overall design of the pod. Make sure to choose a serious coffee company with good reviews and credibility. We can’t speak for every single coffee brand, as all pods are designed differently, however the simple answer is yes – most of them will work in your Nespresso® machine. Thorough testing ensures compatibility. Most serious coffee brands will thoroughly test their pods to ensure complete compatibility with popular Nespresso® machines, including the Pixie, Inissia, Citiz, Essenza and Lattissima series. Providing you follow the correct instructions, most compatible pods should work in your Nespresso® machine. However, some may not work as well as you hoped. It all depends on the pod you choose and the machine you use. That’s why you should use a trusted brand with good reviews. It’s also worth noting that some compatible capsules do struggle when used in fully-automatic Nespresso® machines such as the Prodigio, Nespresso-U®, and the Expert. This is because these machines are very sensitive. Even tiny modifications to the original Nespresso design can result in problems during use. We can't speak for the rest, but Real Coffee's compatible capsules are 100% campatible, even when used in a fully-automatic machine such as the Prodigio, Nespresso-U®, and the Expert. This is because every batch of coffee that comes from Real Coffee's state of the art lab is developed by professional engineers as well as coffee experts. The perfect pod and coffee flavour is as much a science to Real Coffee as it is to Nespresso®. While Nespresso’s status as the luxury brand is hard to beat, there are big benefits to using compatible Nespresso® pods instead. One of the biggest is the potential savings, especially if you are a heavy Nespresso® user. Compare a 39p Nespresso® pod to a 19p compatible pod from Real Coffee. Even if you drink just three cups a day, you could save around £219 a year using compatible pods instead of original Nespresso! For a large family, or even an office using 10+ capsules a day, the annual savings would be huge. Another big benefit is that the choice on offer is very wide-ranging. There are many other styles of capsule you just can’t find in the original Nespresso® range. For example, organic and Fairtrade coffee, speciality flavoured coffees, and even hot chocolate pods. Purchasing your capsules is another advantage of using compatible Nespresso® pods. For example, you can usually pop into your local supermarket and buy a box of compatible pods. You can also buy directly from a brand online in smaller quantities to suit your desires. At Real Coffee we invest in quality coffee rather than spending big money on marketing, advertising campaigns, and rent for expensive shops. This means we are able to offer great quality coffee at a highly competitive price. We are also proud to offer two brand new products for Nespresso® machines: hot chocolate pods and caramel-flavoured coffee pods. Buy a small amount to begin with whenever trying a new brand, variety or flavour. If you aren’t a fan of the taste, you won’t have wasted your money on a huge shipment of pods. Try a taster pack of Real Coffee’s most popular varieties to find your favourite. We’ll give you your money back if you don’t like them for whatever reason – no fuss. Use a trustworthy brand! As quality greatly differs with compatible capsules, make sure you buy a brand of coffee you can trust. And always buy from a retailer or marketplace that offers a money-back returns policy, should you be dissatisfied with your coffee. In 2018, buying a pack of Nespresso®-compatible capsules from a good brand couldn’t be easier. You can buy a big range of pods in supermarkets like Sainsbury’s, Tesco, Waitrose, Aldi and Lidl, whether that’s CafePod, Douwe Egberts, or the supermarket’s own range. Real Coffee has been reviewed in full by CoffeeBlog – the UK’s leading coffee blog – and has received praise from publications including Healthy Magazine. We also pride ourselves on a big range of great reviews from coffee drinkers on Amazon – in fact, our reviews are even better than the leading brand. Check Google for reviews if you are not familiar with a certain coffee brand. That way you can see if other coffee lovers enjoy the coffee and service offered. If you’re a long-time Nespresso® user who is curious about using a compatible pod, but are worried that you’ll miss the flavours you are used to, we understand. To help make your decision easier, we’ve highlighted five popular Nespresso pods and the Real Coffee alternatives. Kazaar is an intense, syrupy coffee which shares characteristics with Real Coffee’s Espresso Roma – both give a powerful kick, and are excellent for the mornings. Roma is a dark blend of 70% Robusta and 30% Arabica beans (all Fairtrade coffee). It offers a strong taste, rounded off with a lingering hint of hazelnut and a rich crema. Both Kazaar and Roma should be added to milk, as their flavours can be too strong for drinking neat. Made with a blend of Arabica and Robusta beans, Ristretto is another intense espresso from Nespresso, although easier to drink on its own without milk. This is the same for Real Coffee Venezia, which offers a familiar bold taste that’s well-balanced and spicy. Like many others in the Real Coffee range, Venezia is Fairtrade-certified. Arpeggio is a bold dark-roasted coffee with slight notes of cocoa, which shares many flavours with Real Coffee’s Single Origin Sumatra. The Sumatra is one of our organic and Fairtrade coffees, cultivated by the Mandailing people of northern Sumatra. It offers a complex flavour, with a slight herbal, chocolatey finish. Nespresso’s Arpeggio Decaffinato is very similar in flavour to the brand’s original Arpeggio, although without the caffeine. For those who want full flavour without the buzz in a compatible capsule, Real Coffee offers Torino Decaf. This blend is made with 100% Arabica beans from South America, while the decaffeination process is completely free from chemicals. For a longer drink, Nespresso’s Fortissio Lungo retains a rich full-bodied flavour, and shares some similarities in taste with Real Coffee’s San Marino Lungo. San Marino is both Fairtrade-certified and organic, and offers a smooth long coffee, with an intense yet creamy flavour. It’s worth pointing out that Real Coffee have different coffee experts to Nespresso®, so you won’t find two varieties that taste identical. However, when it comes to strength and tasting notes, there are certainly common features with the coffees listed above. Be careful not to trust the coffee strength on the package – people taste the same coffee very differently. A ‘9’ to us may only be a ‘7’ to you. If in doubt, buy smaller quantities in the first instance. It’s worth spending an extra second to ensure the Nespresso® pod is lined-up in the machine correctly. When you close the machine, press firmly to pierce the capsule and foil, but don’t force it. If it feels like there is too much resistance, check the pod is loaded correctly. To get the optimum taste from your speciality coffee, we advise using filtered water. Filtration reduces the chlorine, sediment and odours in the water, as well as ‘softening’ the water – this is particularly important if you live in a hard water area of the UK. A warm machine works more efficiently – the pods pierce easier, the coffee pours smoother, and the taste is even better. Turn your machine on and run some water into a cup. This will give you improved coffee extraction, as well as a warm cup, which all leads to a better overall coffee experience. Keep your machine descaled and maintained to ensure the inside of your machine functions correctly. Keeping limescale out of your machine will help it last longer and the coffee taste better. Real Coffee offer an excellent decaling solution made especially for Nespresso® machines. Nespresso® Pods and The Environment: Are They Bad? Much has been said about Nespresso® pods, compatible capsules and the environment, and there’s no doubt that throwing a pile of aluminium capsules in landfill is no good for the planet. Which is why we recommend using recyclable plastic pods. Compared to other materials, the production of a compatible Nespresso® pod made of polyethylene – a plastic material that is often used for food packaging – has less impact on the environment and can be easily recycled. Simply open the pod through the foil at the bottom, then empty the coffee remains into your food recycling bin or onto a compost heap. Then just add the empty pod to your household plastic recycling. Simple! It’s worth highlighting that using coffee capsules in a smaller household or for a single cup of coffee may be a more environmentally-friendly alternative to making a pot of filter coffee. This is because it is quite difficult to brew the right amount of filter coffee in the traditional way for just one cup. Using pods means less energy is wasted and less coffee is thrown away. All our pods are made of polyethylene, meaning they are completely recyclable. 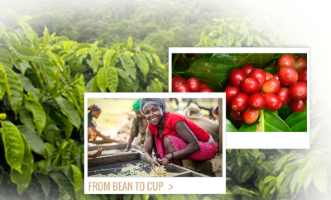 You can read more about Real Coffee and the Environment on our dedicated page. We are working to develop a capsule that consists of 100% compostable material, but we have not yet found the right material and quality that ensures 100% compatibility with all Nespresso® machines. Better for yourself and the environment. Organic is certainly a buzz word these days, but for good reason – organic produce is better for both yourself and the environment. Organic coffee in particular, because regular coffee is one of the most heavily chemically-treated foods in the world. 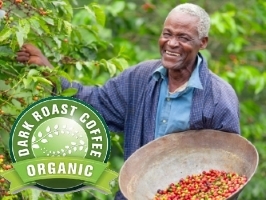 Organic coffee is richer in antioxidants. While the taste isn’t necessarily better than regular non-organic coffee, by using compatible Nespresso® pods filled with organic coffee, you are not ingesting potentially harmful chemicals that have been absorbed by the beans from the use of synthetic additives or fertilizer. It has also been found that organic coffee is richer in antioxidants than regular coffee, which can only be a good thing. Meanwhile, organic coffee is generally better for the environment. This is because there is no use of chemicals that can affect the local habitat and harm the people who live on and near the coffee farms. While using Fairtrade-certified coffee has no real impact on you or your coffee experience, using it can be a huge deal for the coffee famers who produce the coffee you drink. This is because Fairtrade works to improve the coffee farmer’s quality of life, give them fair wages, and enable their children to attend school, while helping to develop local communities. It may not taste different, but it’s a coffee with a good heart. At Real Coffee, 80% of our Nespresso-compatible capsules contain Fairtrade coffee, and we are working on the rest. Just like our organic varieties, we charge no extra for using Fairtrade-certified coffee in our Nespresso pods. We touched upon it earlier in the article, but the best way to take care of your machine is to give it a regular descaling. The good news is that it doesn’t take long – around 10 minutes every month or so. It will certainly be worth it in the long-run, when you are using your Nespresso® machine with no problems ten years later. Make sure to check out our guide to descaling your machine for everything you need to know about this essential process. Test your tap water to see how hard it is. The harder the water, the more often you should descale your Nespresso® machine. Does Using Compatible Nespresso® Pods Void Your Warranty? In short – no. 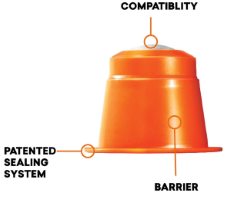 Using compatible capsules from any brand will not automatically void the warranty on your machine. In fact, Nespresso® has officially stated that using alternative pods in Nespresso® machines does not void the warranty. To consistently get a great taste from your compatible Nespresso® pods, you should ensure the amount of water in the cup is not too much or too little – otherwise the taste can be too weak or too strong. A Nespresso® machine will default to produce an espresso at 40ml and a lungo at 110ml. For a look at setting the correct water amount for a wide range of Nespresso® machines, check out our complete guide to cup size programming. We recommend an espresso size of 40ml, with a lungo of 100ml (slightly shorter than the Nespresso® default). If you prefer your coffee extra strong, adjust the size of your espresso to 30ml and your lungo to 80ml. If you wish to learn more about Real Coffee’s selection of quality coffees visit the shop at www.realcoffee.com, or feel free to write us at service@realcoffee.com if you have any questions. We are always happy to help.